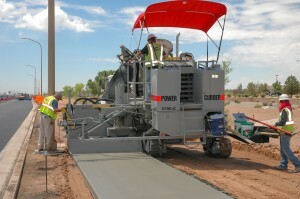 Albuquerque Asphalt faced a common problem for asphalt contractors – to subcontract or self-perform concrete work. Though they handled dirt work and asphalt in-house, subbing concrete and underground work left them short of the 50% self-performing requirement to bid work as a prime contractor on many jobs. When an experienced concrete crew became available last fall, the decision to bring work in-house became an easy one. Shortly thereafter, another decision – what type of slipform machine to choose – took more work. 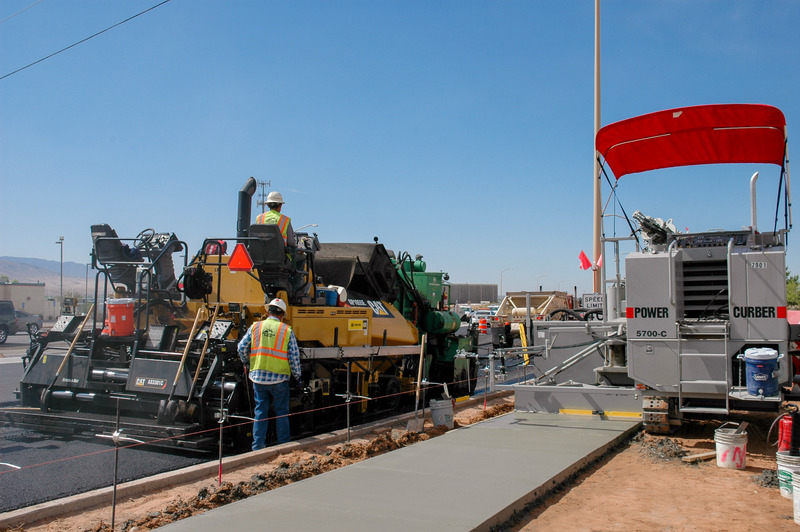 Albuquerque Asphalt had worked around one Power Curber competitor and bought asphalt paving equipment from the dealer of another, so the field was wide open. The leadership of Albuquerque Asphalt did their homework, traveling to jobsites in three different states and watching all three brands in action. After seeing the machines pouring, the decision was clear. The Power Curber 5700-C was the fit for their curb and gutter and sidewalk needs. President Bob Wood and Vice President Jacky Spencer spent weeks researching machines; in the end, the operator-friendly design, compact size, and labor saving features of the 5700-C won them over. “When we saw the size of the machine and the simplicity of steering the front track only, we knew it was what we wanted,” explained Spencer. By May, Albuquerque Asphalt took on six-foot sidewalk. 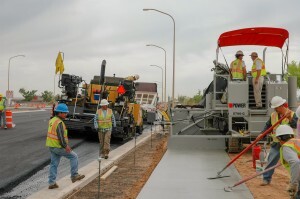 The project, a widening of State Highway 528 in Bernalillo, NM, enabled the company to utilize crews and equipment from throughout the company. 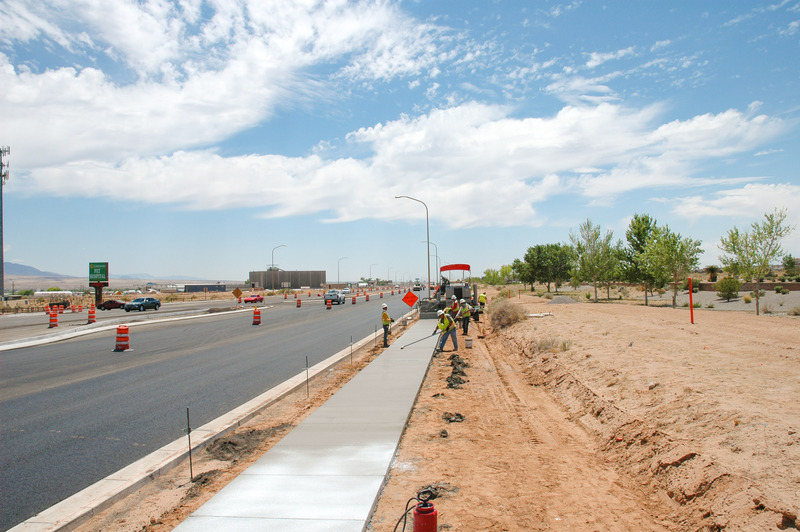 During our visit, the 5700-C poured sidewalk, while only six feet away their asphalt crew simultaneously paved parallel to the sidewalk. 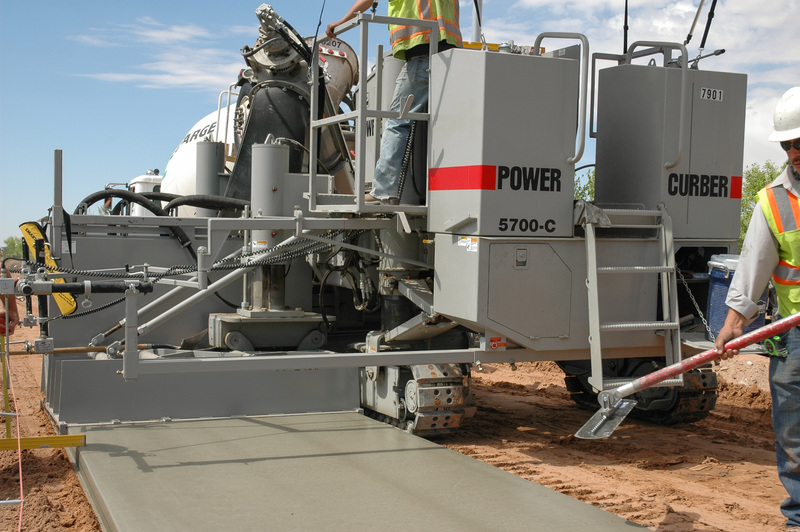 Like the choice to get into concrete work, slipforming the sidewalk wasn’t an easy decision. “I thought we should do the sidewalk by hand and save on the mold investment. But when we realized we’d get off the job five days earlier by slipforming it, I changed my mind,” reflected Spencer. In July, an opportunity arose to pour a golf cart path on an area municipal golf course improvement project. With existing sprinkler heads located only 18” from either side of the intended path, the 5700-C squeezed in between, allowing Albuquerque Asphalt to pour the job in center-pour setup. Like the curb and gutter and offset sidewalk jobs, the work went smoothly and productively under the watchful eye of many city officials.